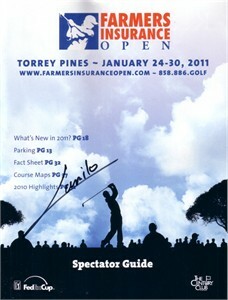 Complete magazine size program from the 2011 Farmers Insurance Open autographed by PGA Tour superstar Camilo Villegas. MINT. ONLY ONE AVAILABLE FOR SALE. With certificate of authenticity from AutographsForSale.com.